I have hosted gathering for tasting 1978 one of the finest Romanée-Conti. 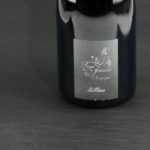 Empty bottle of Romanée-Conti is priced $500!? This bottle had been matured for 24 years. More maturity might be able, but we decided it’s about time to enjoying peak of flavors. Number of party was nine, 80ml per person is borderline amount for spending much time for tasting great wine. For comparing texture of the finest wines, Chateau Latour 1978 was ready as same vintage year. 1978 Chateau Latour was opened before the party start. When just opened, it was not expressive, but after two hours, strong aroma appeared. Typical Pauillac, spice, strong herb, ripe red berry, flavor with more wildness than sweetness, smooth and massive tannins. coffee beans and smoked oak in aftertaste. In empty glass, flavor of prune and vanilla of barrel. A little bit closed flavor might be caused by recorking. Cork of Romanée-Conti aged after 24years had still strength, and successfuly uncorked. As soon as Romanée-Conti had poured into a glass, strong scent appeared in the air. All guests smiled. It is said “When Romanée-Conti is uncoked, room will be full with its aroma”, we realized it. Perhaps D.R.C Richebourg of great vintage has fragrant and similar aroma of Romanée-Conti, you can enjoy tasting Richebourg for realistic price, instead of over-priced Romanée-Conti. When I tasted with time and care, I could feel sweet fruits and concentrated raisin. 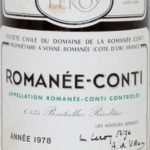 Feeling more sweet Romanée-Conti than strong Chateau Latour, showed that 1978 Romanée-Conti had ripened extraordinarily. Not heavy, but ultimate balanced. Fullness, round harmony of bouquet, flavor and textures. The party had a member who is a famous dentist and a dedicated wine lover, and he brought a special glass for Romanée-Conti. Bacarrat made unique glass named “dégustation Romanée-Conti”. It was expected to be the best glass for tasting Romanée-Conti. But, the glass is large (capacity 1500ml as two bottles of wine!) and looks about size of human head, so amount of Romanée-Conti is very very small on the whole. He found precious flavor became week in the thick glass, eventually pour into same size glass as other guests. Bacarrat’s glass “Romanée-Conti” is made for person who drink plenty of Romanée-Conti by oneself or two. Then, every member said “Me too!” with smiling voice, shared and picked at sediment. Generally, sediment of wine is rough, gritty, acrid and tasteless. but sediment of Romanée-Conti was velvety, fine flavored and tasty, as members wanted one more. Romanée-Conti is delicious, even the sediment is also. Tasting 1978 Romanée-Conti is over with precious memories in all members. I have acquired significant experience for select quality wines and being a buyer of exquisite taste. 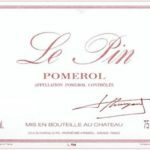 A member who works at wine importer says “The tasting was amazing, and the documents about the party is my treasure” even now, after over 10 years of the day. If you want to know more description of taste of Romanée-Conti, please read novel ≫ “1935 Romanée-Conti” by Ken Kaiko. （However, expressions in the sroty is not unsuitable for your experience or preparations. you would understand the reason just by reading it. It is sure that Romanée-Conti is the most expensive wine in the world. Often quoted example is hammer prices at international Auctions. Following list have hyperlink for auction results. These prices seem not as wine, but as rare antiques. Winning bidder might resale when price rise. Particular vintages will disappear year by year. In future a new record price is possible. Perhaps it’s dummy price. When someone apply to shop, would get estimate price and start negotiation. A lot of additional values are in the bottle. It is not anything to drink, truly a treasure, an antique and a historical heritage for millionaire. Unexpectedly, Romanée-Conti is sold well despite high price. When I check the stock and price list of online wine shops and wine importers several years ago, nearly all Romanée-Conti are sold out. In fact, Romanée-Conti goes out of stock in ascending order according to price, and its lower price is rising year by year. At stores in Japan, customer is not only japanese, also Chinese, Korea, Hong kong, etc… It is uncertain whether they will drink for themselves or resale. In wine market, price of Romanée-Conti is increasing. 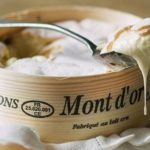 Romanée-Conti is investable. in 2002, I bought 1978 Romanée-Conti for tasting party. It cost me￥700,000(purchase price for shop) . In 2007, over￥1,000,000. In 2017, over￥1,500,000. Romanée-Conti is sold at a different price by each store. (In list above, 1976, 1990, 2009 are in different stores）great vintage 1978 seems to be available, but be found hardly. Price￥2,000,000 is reasonable for now (a little cheap). Change in Romanée-Conti’s price suggests low probability of decline in price. However, there is risk for buying old vintage wine, some bottle has damaged. There is no guarantee of best condition. Only after uncork, you can check it. If your bottle is very good, you are lucky. Even if very bad, you are able to talk about it as an interesting topic. If perchance your bottle is fake, you should submit the evidence to investigative organization. 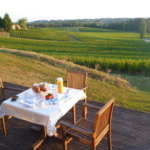 All experience become precious episode about your wine journey. 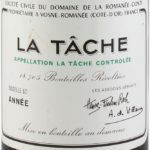 At online auction, ≫ empty bottles of Romanée-Conti are exhibited in high prices at Yahoo Japan. Empty bottles have little practical sense, are just display without one’s own memory. And the worse part is, it cause serious problem. Empty bottles including Romanée-Conti, DRC, top of Burgundy, Grand crus classes Bordeaux and others should not be dealt. Because empty bottles help making fake wines. Fake wine in genuine bottle deceive easier. If several hundred dollars could be alchemized into over ten thousand dollars, they find a market. At right in the image above, 1978 Romanée-Conti is fake made from empty bottle of other vintage. Please see that capsule is plain strangely, bottom of bottle has incorrect emboss, Leroy label has different color. 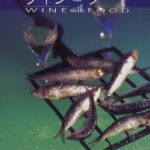 It has detected by a member in some wine forum. A producer of top Burgundy said “When you drink up, break up your bottle, please.” Fake wines are hateful, abominable crime. Romanée-Conti is famous even among people who don’t know about wines. Romanée-Conti is well-known but little known actually. Limited number of people know its taste. 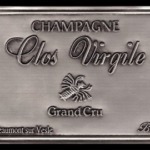 Romanée-Conti is told as a legendary wine, have a place of honor in the highest price, get away from values as a drink. I have felt sorry circumstances of Romanée-Conti, so I wrote a short allegory. Please check it. ≫ This article has Japanese ver. © 2019 HATO BAR All Rights Reserved.